That's What I Said is a casual conversation between two long distance best friends, Matthew and Joanna, who enjoy making each other laugh. Download an episode and hang out with them! This episode starts out as an impromptu cooking show while we all visit Joanna in her kitchen as she makes something that she calls taquitos. Then, in honor of the Academy Awards, Matthew and Joanna talk about their favorites throughout the years. All the glitz and all the glamour! This week, Matthew and Joanna visit the red carpet and talk about the 2019 Oscar nominations. Also, what would you do for $10,000. This might be the wackiest episode yet! This week, Matthew and Joanna talk about Things That Turn 30 in 2019 and The 5 Best-Selling Fast Food Items of 2018. This week, Matthew and Joanna talk about Ariana Grande’s new music video for thank u, next, Joanna gets into a fight with a restaurant server and a cockroach, and Matthew discovers that he doesn’t really care for Christmas movies. Plus, there’s some food news thrown in there to make you hungry. We’re Matthew Dickens and Joanna Zaleski, and we’re just two crazy best friends who like to talk about different things and make each other laugh. It’s been so long. How do we do this again? Matthew and Joanna are back! This week, the duo get caught up on each other’s lives and discuss The Chilling Adventures of Sabrina, the latest season of Riverdale, and then wrap it up with an appropriately dumb game. 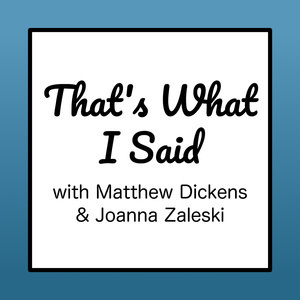 This week, Matthew and Joanna talk about Matthew’s recent trip to Cuba, Joanna surviving Hurricane Florence, and they find out which Golden Girl they most embody. This is Podcast in Paradise, Matthew and Joanna’s bonus mini-series of a weekly recap of Bachelor in Paradise. How Do You Eat These Things? This week, Matthew and Joanna talk about Matthew’s sister’s wedding, baby names, and a BuzzFeed survey on how people eat certain foods. They also announce their new bonus mini-series, Podcast in Paradise. This week, Matthew and Joanna are joined by Joanna’s husband, Ryan. The trio forgot to prepare anything to discuss and, with some new technical problems, the show goes a little off the rails. Enjoy! This week, Matthew and Joanna discuss birthday gifts, fireworks, the TWIS drinking game, and what it means to be living the modern American dream, as well as podcast shoutouts for Going Postal, Glad You Came (explicit), and Hollywood Babble-On (explicit). This week, Matthew and Joanna talk about the recent Tony Awards and then take an online quiz to find out which Hogwarts house they belong in. Spoiler alert: neither got the house they were expecting. This week, Matthew and Joanna attempt to do their first livestream on YouTube, despite all the technical difficulties. They also reenact the questions and answers portion of Miss USA 2018. Please be sure to subscribe on iTunes or Google Play, and leave a five star rating and review. The intro and outro music has been provided royalty free by AudioBlocks. This week, Matthew and Joanna talk all about royal wedding etiquette, for those who received an invitation. This week, Matthew and Joanna go off script! This week, Matthew and Joanna compare how well each other is at being a fuctioning adult. Who do you think will win? This week, Matthew and Joanna talk about Love, Simon, music by Trixie Mattel and Jesse Power, Renee Zellweger as Judy Garland, and there’s a very heated debate over some broadway divas. 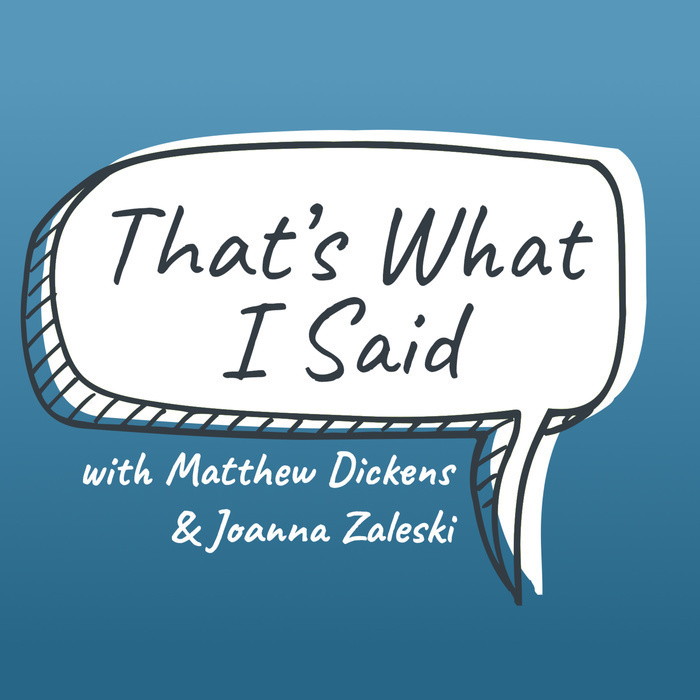 In this premiere episode of That’s What I Said, Matthew and Joanna discuss impersonations, where to start a new life, coordinating goats, and theatre auditions.